Here you go pretties! 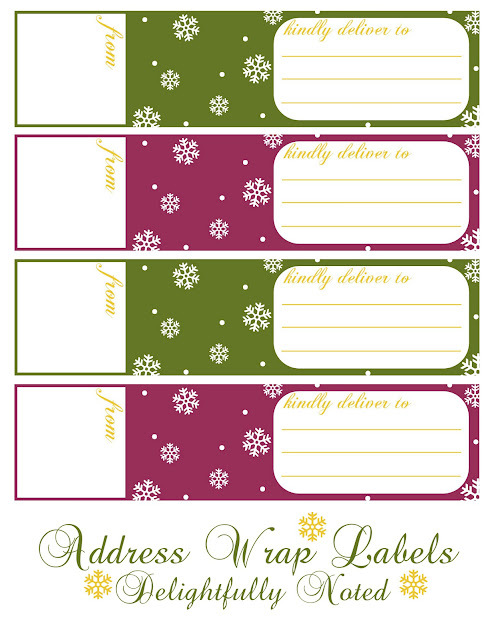 Printable wrap around address labels for those of us who are fashionably late on getting our holiday cards out. I created these to use for my own personal greeting cards and figured since it's the season of giving why not share them with you? If you haven't noticed I am feeling quite generous this week so I suggest taking advantage of this freebie because after the New Year I expect to be compensated for all my printables. Payment will be required in the form of Pinot & miniature daschunds. Kidding. About the doxie part that is. Wine is always welcomed. Download your free labels here. You can print on label paper or regular computer paper & use double sided tape to adhere them to your envelopes. view examples from these Etsy sellers. my printables! So don't be shy. How many of you haven't mailed your holiday cards yet? Also, in related news, while looking at the pet shop in the mall recently I saw these adorable little dogs that were miniature pinchers/chihuahua/weiner mix. I turned to Joey and was all, "Awww... we can call them mini-pin-chi-weiners." And it was only after he looked at me dumbfounded and then bursted into laughter that I realized how that actually sounded out loud. O.o Some things only sound good in my head. Sadly I have not sent my Christmas cards yet. I now have our Christmas photo but need to get them in the cards! So, thanks for the printable. great idea!!! i will totally use this!! Awesome! Unfortunately no wine here -- unless you want the bunch of grapes on the kitchen counter as sort of a DIY kit. No -- well, how about some gratitude? Thank you for sharing! What a great idea! I might give them a go this WE. I just stumbled across your blog & so glad I did. I have signed up as your latest follower. I look forward to popping back for some more inspiration!